Taken with Olympus E500 digital camera December 27th 2007. Click image for larger view. The moon was very beautiful today so I had to take a picture when it was about to disappear behind a mountain on the island Senja. 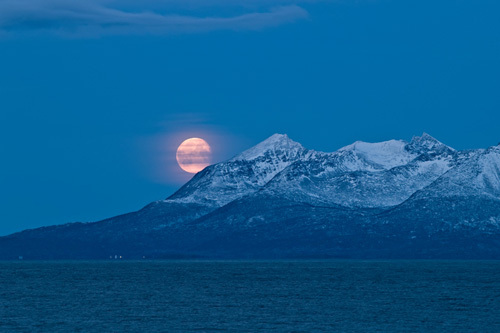 Senja is the second largest island in Norway with its 1586,3 kmÂ². I see the island every day in the horizon so that is why Senja often appears in my pictures. A late merry Christmas to everyone! Gorgeous! I love the almost monochrome look to the photo, and the serenity of the moon sailing behind the mountain. So this is midday? It is a lovely shot, but it does make me feel a bit chilly. It’s so peaceful! I don’t feel chilly, I think the picture has a warm feeling. What a fabulous shot! I personally can’t stand cold weather (we do get winter – but nothing like your winters! ), but I have always loved cold weather photography oddly enough! Thanks for sharing your photography with us! This is really one of your better shots. Good to see that there is something about the heavy clouds covering this part of Norway. The moon, clouds, and mountain are just perfect – great capture! Yea, we’ve past winter solstice so the days are getting longer, day by day. While I’m here: Thanks for your friendship in Blogsphere – wish you a great 2008! GREAT photo, Thomas! I love it! WOW! Beautiful shot! Thanks for sharing! O mammamia! Uno spettacolo splendido! That is just stunning. Thank you. I have to show my husband your picture! Yowza, your eye for nature is amazing! You’ve captured a magical moment… this is the type of scene i would imagine in a dark fantasy. The kind of tale with mythical creatures and the like. Great shot, I wish I could see it in person! Your island like Indonesia languages. Indonesia languages having word “Senja”. Meaning between afternoon to night. Big moon and good color .. blue and white. I always see big moon (full moon) in top my home every month. it having white color, very light. It is beuatiful. Your place, always snow ? Very beautiful….just like my daughter Senja, Senja was named after my grandmother, Senja Maki, who was born in Finland!